Blockchain is a shared ledger for recording the history of transactions. Data is stored in an immutable record which can be accessed by all participants in the network. This new technology enables new levels of decentralization, security, and collaboration previously unattainable. Migrating business operations to a new technology stack can be intimidating and complex. Our full-service blockchain expertise – hardware, software, and data center infrastructure – allows you to take advantage of this new technology with the help of a trusted partner. Whether hardware, software, or data center deployment, we provide comprehensive solutions. Our data centers are engineered and built from the ground up for high performance blockchain hosting. Our prebuilt network of decentralized data centers are available to host your custom blockchain implementation. Deploying your blockchain with us means achieving a redundantly distributed blockchain network from day one. 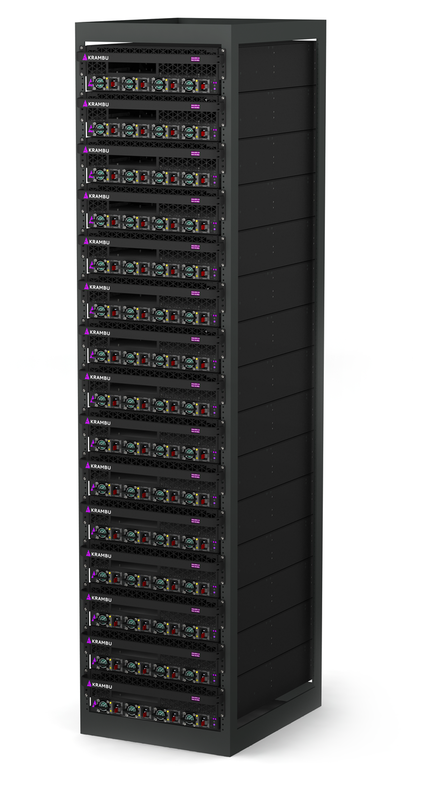 As an OEM manufacturer, we have designed and produced specific hardware appliances for private blockchain hosting. Engineered for enterprise grade reliability and uptime, our equipment is optimized for maximum efficiency without compromising performance. Our appliances achieve the highest density, performance and efficiency in the industry, reducing our data center footprint and overhead expenses. We implement blockchain software solutions customized to meet your company’s specific business requirements. This allows your business to simultaneously obtain the advantages of secure decentralization, uptime, and scalability, while also maintaining privacy, confidentiality, and permissioned network participants. KRAMBU is innovating the blockchain space by introducing the first-of-its-kind blockchain deployment platform coupled with an integrated proof-of-work marketplace. If you’re considering building your own blockchain solutions in-house, we also provide advising and consulting services for private blockchain implementation. Contact us to learn how your business can utilize this transformational technology to achieve new levels of decentralization, security, and collaboration.